[dropcap]S[/dropcap]ince the curtain first went up at the John W. Engeman Theater in June 2007, the storyline has been the same: convincing a skeptical Long Island audience that they can see a Broadway-quality show on Main Street in Northport. As time goes by, the narrative seems more and more believable. Last year the Engeman drew more than 100,000 people (114,946 to be exact). They came to the Island’s only full-year Actors Equity theater, which means that its performers and stage managers are in the same union as those in Manhattan—and explains why its stellar performers may often be winners and nominees of the prestigious Tony Awards and the Drama Desk prizes. The venue’s odds-defying success—surviving the unforgiving Great Recession as well as Superstorm Sandy—is a tribute to two unlikely partners: managing director Kevin O’Neill, 50, and artistic director Richard Dolce, 44, who share an office in the theater’s refurbished basement. They came together almost by chance one day in 2006 when running a theater in Northport was literally the last thing on both their minds. But their business model seems to be working in a community that formerly couldn’t keep even a 99-cent movie house going. The ticket prices had risen to $1.25 by the time the place closed its doors for good in the 1990s, but that’s not the reason it finally shut down. “There were 700 seats but you couldn’t see from 500 of them!” laughs O’Neill. The Engeman features stadium seating for 400 people, with beverage holders at each seat so people can drink during the show, valet parking at the entrance, a dark-wood-paneled piano bar inside where the popcorn used to be, and, especially for women, impeccable lavatories that would put a four-star restaurant to shame. “People thought I was Felix Unger about that when we were building the place!” says O’Neill with a grin. But he was making a point: This place treats its patrons like adults. They also want to appeal to mature theater-lovers and newcomers alike. By design, their mix of Broadway musicals, comedies and dramas is aimed at the mainstream, not at the experimental margins. Adding to the challenge is that the stage itself—especially the narrow wings—is relatively small by Broadway standards. For “South Pacific,” which opened May 23, the director couldn’t choreograph dance numbers with dozens of sailors. But because the theater space is intimate, the audience tends to feel like they’re almost onstage themselves and they have a part in each performance. So far it’s been a winning formula. O’Neill had been a bonds trader on Wall Street, one of those guys living in the suburbs (Huntington in his case) who regarded going back into the city with his wife to see the theater on a Friday or Saturday night about as favorably as a root canal. Dolce, his future partner, was an entertainment lawyer who had at first rebelled against the family business, the nonprofit BroadHollow Theater Company—where he had done everything from take tickets to run the lights to perform onstage—by going to law school. They met seven years ago when O’Neill was making the rounds of local theater companies on behalf of Theatermania.com, an online service that he’d invested in, and one of those he was making his pitch to was Dolce. “I thought he was a sharp guy and knew what he was doing,” O’Neill recalls. That same day he met Dennis Tannenbaum, who’d bought the Northport venue in 2005 to turn it into a performing arts center. A little while later he told O’Neill that he wanted to get out of the drama business altogether but ensure that the property be preserved for the community’s sake. That’s when O’Neill and Dolce stepped in. Northport’s first theater had opened at that location in 1912 but burned down in 1930. It was rebuilt in 1932 with state-of-the-art fire protection, which meant walls and a roof so thick with cement and steel that they were practically impervious. O’Neill said the renovation, which cost more than $2.5 million, required some very innovative engineering feats to achieve. O’Neill and his wife Patti bought the theater in 2006. The name on the marquee honors her brother, John W. Engeman, an Army chief warrant officer from East Northport who’d done community theater while stationed in Europe. Weeks before they closed the sale, Engeman was killed in Iraq when a bomb exploded near his Humvee. In the theater’s first couple of years about 85 percent of their audience came from within 10 miles. 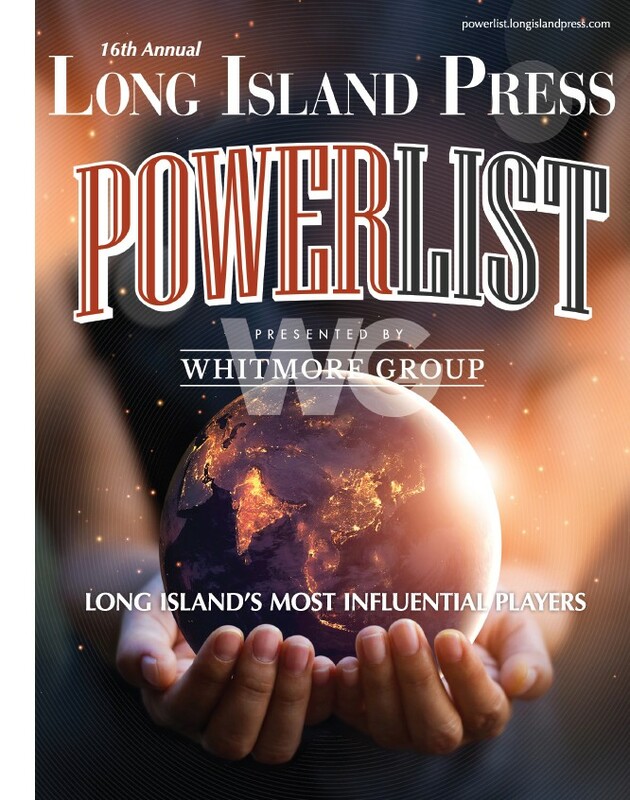 “If you go to the top marketing companies in the world and say, ‘Give me the top ten theater demographics on the planet,’ I’d say that Long Island’s North Shore would be in the top five,” explains O’Neill. 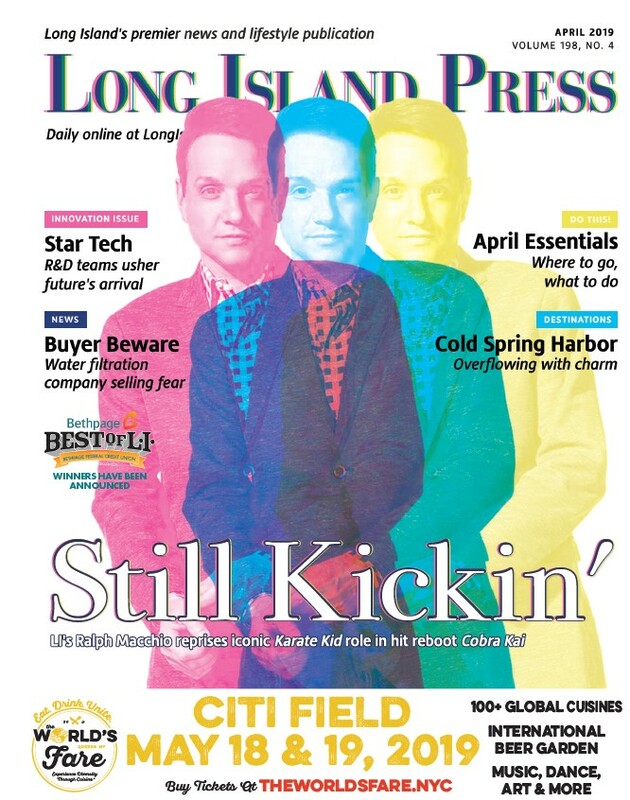 It helps their cause that Northport is “a charming, ambient, cool little village,” he adds. Sometimes the audience’s expectations defy explanation. 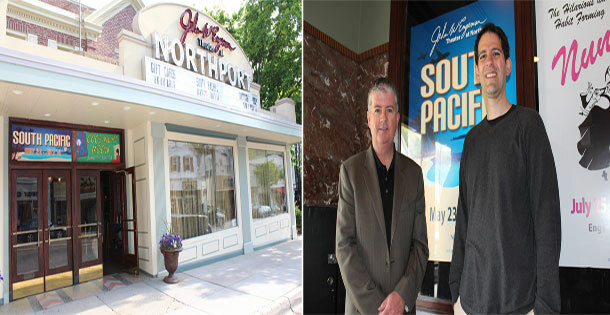 Kevin O’Neill, left, and Richard Dolce, right, have combined their business acumen and creative skills to make Northport the place for affordable and accessible entertainment that would fly on broadway. The Engeman’s living cast is worth the price of admission, thanks to longtime casting director Stephen DeAngelis, who draws from the acting community in Manhattan where auditions and rehearsals are held. Among the perks for the actors, Engeman arranges to pick up the cast at the Huntington train station before each performance and shuttle them back to the city after the show. “Actors always want a good opportunity,” says DeAngelis. The Engeman is there to provide it—and the theatergoer gets the benefit. The John W. Engeman Theater is located at 250 Main Street in Northport. For information call 631-261-2900 or go to engemantheater.com. Performances run Wednesday through Saturday at 8 p.m., Saturdays at 3 p.m., and Sunday at 2 p.m. and 7 p.m. “Nunsense” opens the 2013-2014 season July 25.